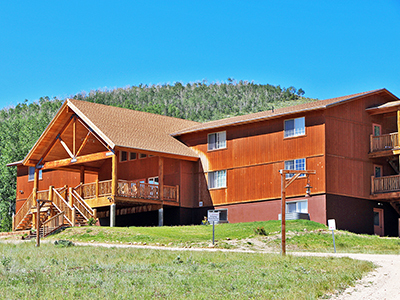 The Tabby Mountain Lodge is a 20 room hotel-style lodge that can accommodate up to 114 people. Each room has its own bathroom facilities and privacy locks. There is a great room or lobby area on the main floor as well as a conference room. A second conference room is located on the top floor. Also, there is plenty of space out on the deck for groups to gather and share good times. A large fireplace adorns the front lobby while wooden beam pillars offer structural support. The lodge includes wi-fi for those who need to check their email. Handicap accessible rooms are also available upon request. This lodge is ideal for smaller groups staying at Reid Ranch and for family reunions. Groups of 80 or more persons may opt to reserve the whole lodge.